We have sold out tickets for our 2019 Conference. If you are interested in attending, please add yourself to our waitlist HERE. We will in every way do our best to accommodate you and your group with housing for the Conference. Free housing is available on campus for visiting students. Click here to access the housing request form. This housing is granted on a first-come, first-served basis to our Conference attendees for the night of Friday, January 18, 2019 (the night of the March for Life, and the night prior to the day of the Conference). Please contact Maria Bujwid, our Hospitality Coordinator, with any questions you might have. Otherwise, we recommend booking rooms at the Georgetown University Hotel and Conference Center. Please note: This is a residential address, but it will bring you right to the front gates. Entering the actual address of the front gates (at 3700 O Street NW) into Uber will result in the ride being routed through the back of campus, and will not bring you to the front gates. Georgetown University provides a complimentary shuttle service – Georgetown University Transportation Service (GUTS) from both the DuPont Circle and Rosslyn metro stops. The GUTS shuttle begins operating early in the morning on weekdays, and runs throughout the day in 10- to 20-minute increments. The GUTS shuttle will drop you off on the campus by McDonough Memorial Gymnasium, a few minutes' walk from the Hotel and Conference Center. Allow a minimum of 30 minutes to reach the Center from either of the Metro stops. However, the GUTS shuttle runs only sporadically on weekends; the spring 2018 schedule for the DuPont Circle and Rosslyn shuttles will be posted in early January. From DuPont Circle: Use the Q Street exit. Exit via the escalator. At the top of the escalator, turn left and cross 20th Street. Turn left, walk down 20th Street, and take the first right onto Massachusetts Avenue. There is no sign for the stop, but the shuttle will stop on Massachusetts just past 20th Street. Wait near the green fire hydrant. From Rosslyn: Take the escalator out the only exit from the Rosslyn station. Turn right at the top of the escalator and walk toward the street. When you get to the street (N. Moore Street), turn left. Cross 19th Street and you will see a sign for the Georgetown University Shuttle. The stop is at the intersection of N. Moore and 19th. Washington, DC has three primary airports: Reagan National (DCA), Dulles International (IAD), and Baltimore-Washington International (BWI). Reagan National is the closest to the city center, followed by Dulles (which is about 26 miles from DC), followed by BWI (which is about 32 miles from the city center). Student and group airfares can be found online at Student Universe or STA Travel. Super Shuttle provides door-to-door van services from all of these airports, or you can take the metro. To get to Georgetown University from Reagan National, take a Blue Line metro in the direction of Largo Town Center and get off at Rosslyn. Then, come out of the station and take a cab across the river to Georgetown. To get to Georgetown University from Dulles International, take the 5A Express Metrobus from bus stop 2E (on the ground transportation level of the airport) to the Rosslyn stop. Then, take a cab across the river to Georgetown. To get to Georgetown University from BWI, you can take an Amtrak train to Washington-Union Station and follow the directions below. Amtrak serves Washington at Washington-Union Station. If you’re travelling from the Northeast, take advantage of a special offer from Amtrak that offers reductions for groups. Student Advantage also offers a 15% discount for members on all Amtrak trains except Acela. To get to Georgetown University from Union Station, take a Red Line metro in the direction of Shady Grove to DuPont Circle. From there, walk to the NE corner of 20th and P Sts. 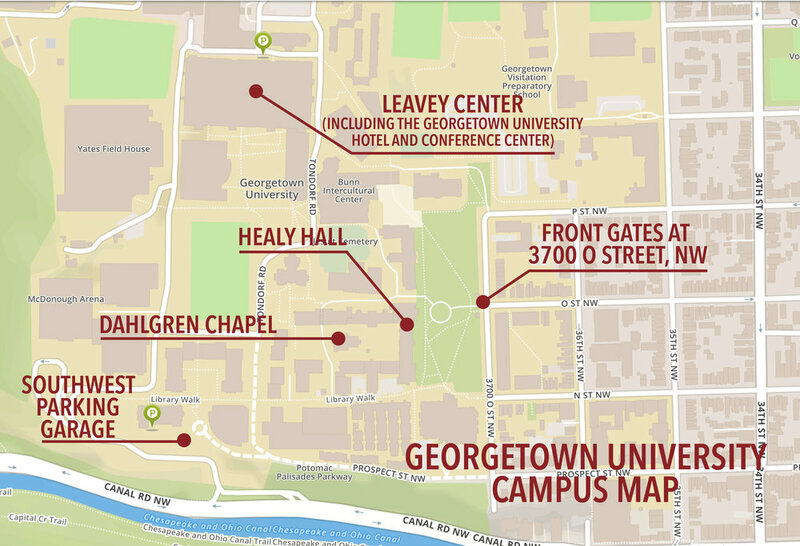 where you can catch the G2 Metrobus direct to Georgetown University. Greyhound and a number of other bus services serve Washington, DC at the Greyhound Terminal at Union Station. Various independent bus companies also offer discount services from the Chinatown neighborhood of New York City to Washington, DC. Megabus also offers reasonable services to and from downtown DC. To get to Georgetown University from Union Station, take a Red Line metro in the direction of Shady Grove to DuPont Circle. From there, walk to the NE corner of 20th and P Streets, where you can catch the G2 Metrobus direct to Georgetown University at the 37th & O Streets stop.